A total of 97 submissions were accepted (96%). Four papers were accepted as posters instead, and 12 submissions were accepted provided the authors made revisions based on the reviews. This final category is new to DHBenelux, and provides an interesting point of discussion for the goal of reviews: is it gatekeeping, or feedback for improvement? These 101 submissions are jointly written by a total of 220 authors, compared to last year’s 204. A total of 25 authors this year were also present in 2016, showing the conference attracted a mostly different group of authors. What’s more, compared to the previous DHBenelux in the Netherlands, only 11 authors return that did not submit anything to the Belgian and Luxembourgish editions, so that the group that returns for the conference in their own country is much smaller than I would expect. 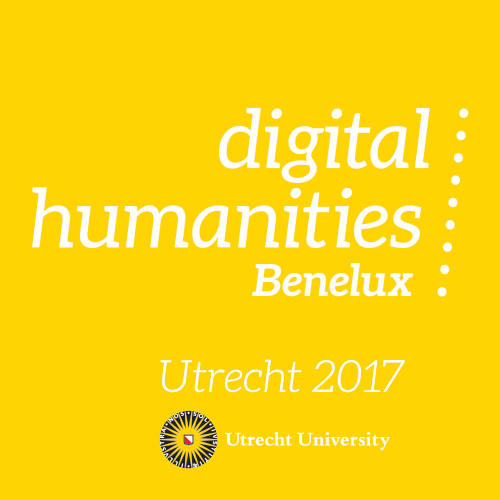 After four conferences, only a single author is left that has submitted to all the DHBenelux conferences: yours truly. In true digital humanities fashion, a lot of papers are co-authored. 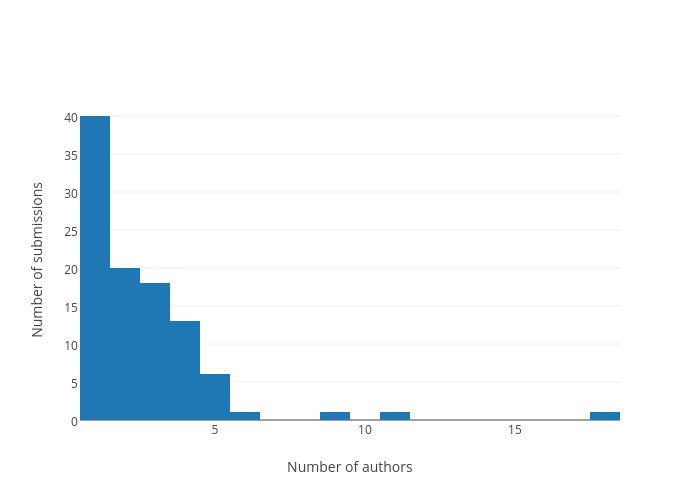 As you can easily see, the average number of authors per paper is 2.2. Less than half of all the papers are written by a single author: 40. One paper even has 18 authors. There are a couple more papers with more than 5 authors than last year, but overall these numbers are fairly similar. The 220 authors come from 17 different countries. Although this is an increase from last year’s 13, and these numbers once again show the conference is more international than the “Benelux” term suggest, I would argue that this year the conference is actually more mononational: 159 authors (72%) of all authors are from the Netherlands. Belgian participation dropped from 55 (27%) in 2016 to just 19 (9%) in 2017. Luxembourgish participation dropped from 21 (10%) in 2016 to a mere 5 (2%) in 2017. Here I must note that I have mostly counted the nationality of the institution, so that I counted myself and another colleague of Dutch origin as Luxembourgish participation. For reasons of privacy, I have combined all the countries with a single author representing under “Other”, I will say however that this interestingly included 3 Asian countries. See the below chart for a complete overview which shows that apart from 12 authors coming from countries not present in 2016 (Austria, Greece, Ireland, Romania), all other representation from outside the Netherlands is down. When we upload all the submissions into Voyant Tools, we get a more detailed view of what the submissions are about. All the abstracts combined contain 88k words, and 15.1k unique wordsThese are not exact figures, since many abstracts contain the paper title, author names, and references, but some do not. 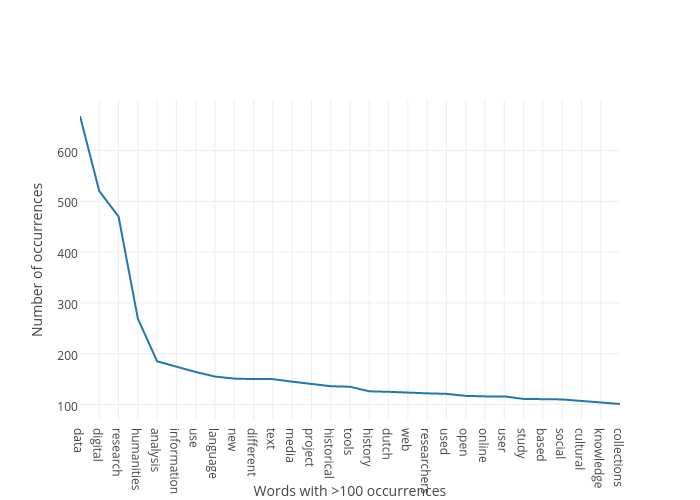 One paper shows in Voyant as having 4500 words, which would be way over the limit, which can be explained by a large network image of terms in the abstract. Finally, I did not combine similar words in this analysis. This review is just to get a sense of the submissions. These are very similar to last year’s figures. The most common word is by far “data”, which occurs twice as often as it did last year. Interestingly, “data” was also the most common word in 2014 when DHBenelux was held in The Hague (the Netherlands), but not in 2015 (Antwerp, Belgium) or 2016 (Belval, Luxembourg). 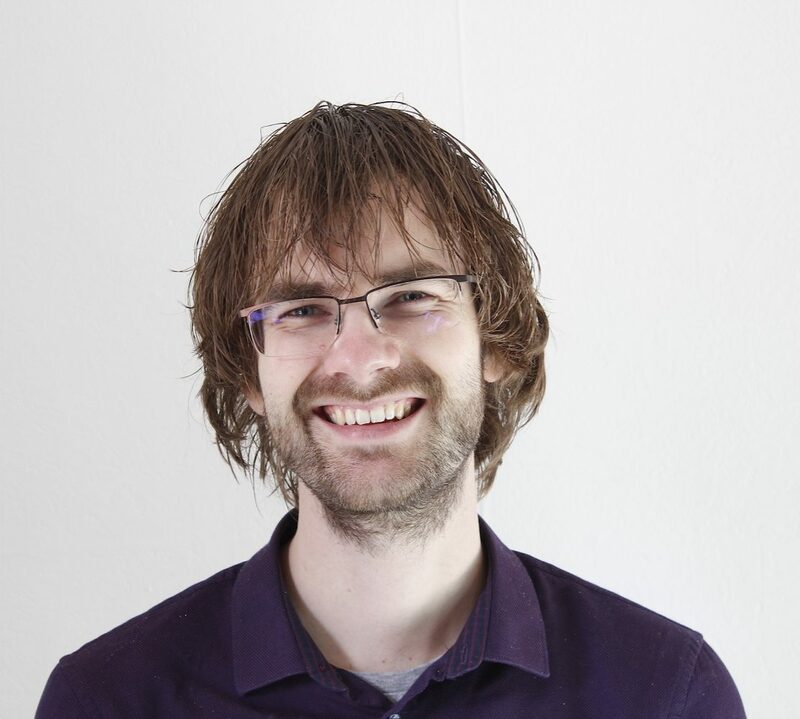 Do Dutch digital humanists write more about “data” than others? Other words typical of digital humanities remain; words such as “digital”, “new”, “different”, “tools”, but also “project” and “user” are prevalent. Overall, it seems DHBenelux did not continue the trend of the last years. 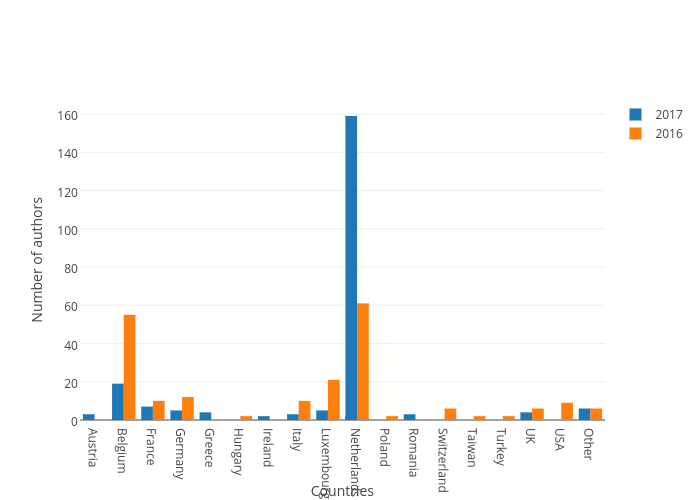 The number of submissions is smaller, and while the number of authors is larger, the Dutch more dominant. Moreover, the acceptance rate is back up from last year, meaning my interpretation that DHBenelux was becoming more selective is untrue; rather, as Steven Claessens tweeted, 2016 might have simply been an anomaly. This high acceptance rate has led some reviewers to question what the goal of reviews is, as this year a fairly large portion of papers are accepted despite negative reviews, provided they make adjustments. Finally, I am surprised by the low number of authors that returns to the conference (as author anyway). Although last year I positively concluded that DHBenelux is no clique, it neither seems to be a community. This need not be a bad thing, but it does raise questions about the direction the conference is going.